Bookish Lifestyle: Baby Product Review: Bibit-All from Kiddologic - Got messy kiddos? You need this! 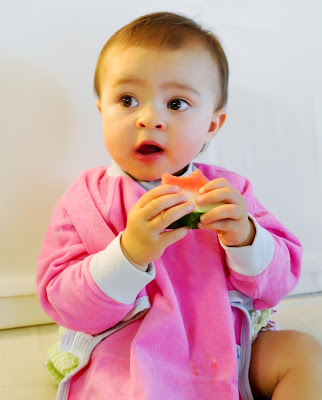 Baby Product Review: Bibit-All from Kiddologic - Got messy kiddos? You need this! The bibit-all™ is a must-have infant/toddler bib that finally gives parents an effective solution to a universal problem - mealtime messes at home and on the go. Conventional bibs, and other full coverage bibs on the market don’t provide true protection of baby’s clothes and are lacking in comfort, ease of use, quality, and style. 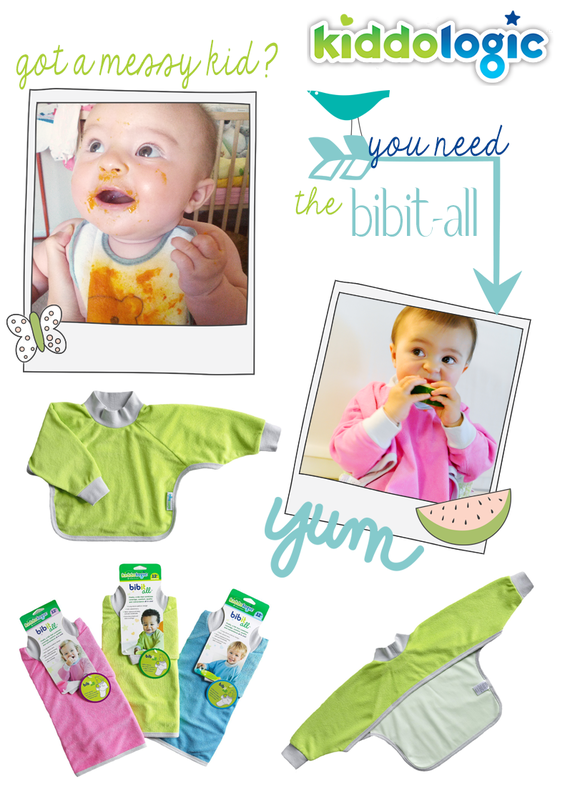 Kiddologic created the bibit-all™ to fill those gaps and provide what is truly the perfect bib. The super-soft, stretch terry bibit-all™ features long sleeves with ribbed cuffs, a high ribbed collar to protect from drips and full coverage that extends to the lap. An innovative waterproof lining prevents foods and liquids from soaking through without adding bulk or restraint of movement. The bibit-all™ is available in three colors: sky blue, wild orchid, and a gender neutral fresh lime - in both an infant and toddler size. The fashionable colors and design make this bib an attractive accessory in any setting. In addition, the bibit-all™ is affordably priced, allowing parents to keep multiple bibs in rotation and making it an ideal shower gift. With it’s superior coverage and comfort, easy-on/easy-off design, plush washable fabrics, and fashionable style, the bibit-all™ redefines the bib. My first thought when we got the bibit-all in the mail was: "Why-oh-why did I not know about this miraculous invention until now?" Victoria is at a stage when she loves exercising her independence by eating snacks and even full meals without my help. She is 16 months old, mind you, she does not know how to use a spoon yet (other than slamming it on the table or trying to hit the dog on the head with it), and, inevitably, she makes a huge mess every time. I'd say about 30-40% of her food ends up in places other than her stomach. Plus, for whatever mysterious reason, she feels the need to squish the food in her tiny fists and mold it like a play-dough before trying to stuff it in her joy-filled face. I guess she is not the messiest kid in the world, but she is still pretty good at getting herself dirty. I have a ton of regular bibs - both the basic cloth ones and the double-layered waterproof ones, but the problem with those is they are too small and too ineffective to actually keep your kid completely dry and clean. They don't stay in place, they soak through, or the food simply drips off of them and ends up in your kid's lap. The Kiddologic bibit-all is the first bib that I can honestly get behind. It really works great. The design is nothing short of brilliant and the material seems to be great at preventing drinks and foods from soaking through to your child's clothes. The stretchy pullover design creates a seal around your child's neck (it's not too tight to the point of being uncomfortable, but it's snuggly enough to prevent leakage), and there are similar stretchy seals around the wrist areas. Additionally, the front is longer than the back, so even if your kid spits or spills a larger amount of food, it won't end up in their lap. The back is short and open, which is awesome for warmer days - no need to worry about your child overheating and sweating while wearing it. The material has a nice texture that stops the food and liquid from sliding down. It's a very neat bib and I wish I had one or two of those when Victoria was first introduced to solid foods, or when she was going through teething and drooling profusely.